Before we venture into the abyssal realm of Chinese and Japanese calligraphy, we need to ask ourselves a question: what does “calligraphy” really mean? Word “calligraphy” has Greek etymology, and it derives from κ?λλο? kallos “beauty” + γραφ? graphe~ “writing”. As much as this may cover the meaning of commonly known craft of western calligraphy, as a skill of aesthetical writing, it does not, however, reflect the true identity of Far Eastern “calligraphy”. Why is it so then? First, let us closely examine, how do the Chinese and the Japanese refer to “calligraphy“. In Chinese, the art of calligraphy is known as shū fǎ (書法, the principles/laws of writing), and in Japanese as shodō (書道, しょどう, the path of writing). What do those phrases tell us? 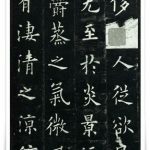 In China, from the very beginning, calligraphy was very closely related to official governmental positions, imperial court affairs, and occult rituals (especially during Shang (商朝, 1600 – 1046 B.C.) and Zhou (周朝, 1046 – 256 B.C.) dynasties. Please refer to Oracle bone script (甲骨文, kōkotsubun), to read more about this. Already during late Han dynasty (漢朝, 206 B.C. – 220 CE), there were eight calligraphic scripts set by law as examination requirements for candidates applying for official governmental positions. They were known as 八體 (Chinese: bā tǐ, i.e. “eight bodies/styles”). Chinese calligraphy, although originally derived from nature and its forces, was constantly formed by specific political and aesthetical reality of ancient China. This trend was very noticeable especially during Tang dynasty (唐朝, 618 – 917A.D. ), one of the most significant periods in history of Chinese calligraphy, which often referred to as the Golden Age of Chinese culture, where calligraphy reaches its peak. 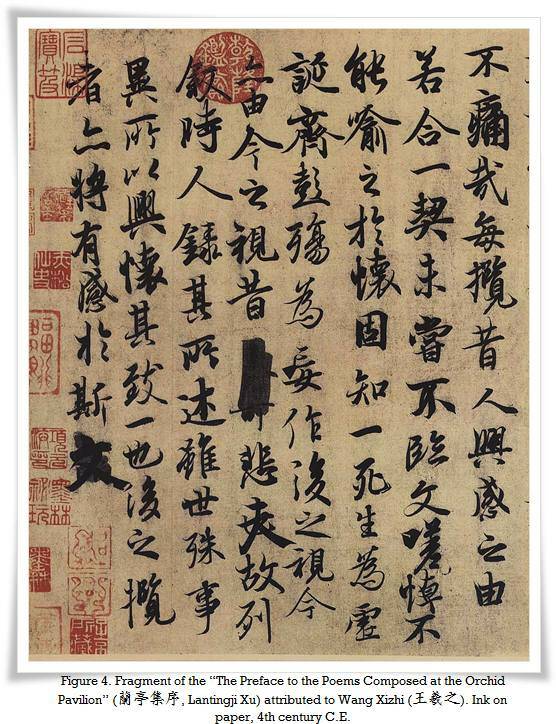 Tang masterpieces (particularly those in Standard script, written by masters such as 歐陽詢 (Ōuyáng Xún, 557 – 641) – Figure 1, 褚遂良 (Chǔ Suìliáng, 596 – 658) – Figure 2, 柳公權 (Liǔ Gōngquán, 778 – 865) – Figure 3, and others) were known from their incredible attention to details and rules of writing, as well as a very strict form of the characters, which is why they often serve as studying examples for many calligraphers, who wish to excel in their technique. 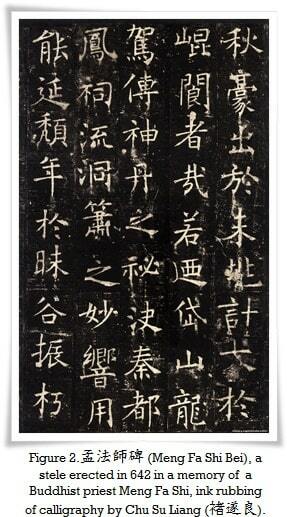 In this capacity, the Tang period calligraphy is the closest one to the meaning of shu fa (i.e. writing governed by rules). On the other hand, if we go back in time to the Northern Wei (北魏朝, 386 – 534) and Jing (晉朝, 265 – 420) dynasties, to works of masters such as “the calligraphy sage” 王羲之 (Wáng Xīzhī, 303 – 361), and his remarkable work in Semi-cursive script, titled “The Preface to the Poems Composed at the Orchid Pavilion” – Figure 4, we will find in there a strong tendency towards expressing feelings, passion and joy of writing, rather than rigidness of form or surgically precise brush technique. In Japan, the full meaning of shodou is “a path of life through writing (calligraphy)”. Japanese aesthetics vary greatly from the Chinese ones, as well as the calligraphy itself was utilised for more spiritual and artistic purposes from the very beginning (copying of Buddhist sutras, poetry, etc), than originally in China. 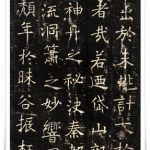 This is why, perhaps, three centuries of search for a truly unique Japanese style of calligraphy (since importing Chinese characters as a writing system around 5th century C.E. ), a trend known as 和様書道 (わようしょどう, wayō shodō, Japanese style caligraphy) emerges in 9th century C.E. It is also not surprising, that Japan is the place where modern calligraphy style, called 前衛書道 (ぜんえいしょどう, zenei shodō), was initiated. What Grand Master 比田井天来 (ひだいてんらい, Hidai Tenrai) implemented in his works in the 19th century, has profoundly influenced the entire world of calligraphy, and other art schools as well (mainly sculptors and painters). How does the above (shodou and shu fa) help us understand the essence of the art of calligraphy? Many of my friends, when admiring a calligraphy work, they search for “touchable” and “definable” references to the surrounding world. In the calligraphy of character “movement” (動), they will seek a figure of a sportsman, in the calligraphy of character “sea” (海), they will try to find shape of ruffled waves, etc. This is a common mistake, and it’s caused by many factors. One of them is lack of knowledge of kanji and their specific nature. Another one is a western mind setup. Look at the history of art in the western and eastern sides of the world. In the West, we evolved from realistic paintings to the abstract works of Picasso, and beyond. The East evolved in a completely opposite direction; from totally abstract (first pictographs, and then symbolic ink paintings), to realistic painting of the 21st century. It is remarkable, that, until very recently (19th century), realism in painting was considered vulgar by many artists and critics here in the Far East. We must remember that calligraphy and painting are considered to be sister arts in China. They share the same principles (single strokes, no retouching, abstract lines), and the same tools (The Four Treasures of the study, i.e. brush, inkstone, ink and paper). Therefore, they should be understood and “read” in similar way. Just like it is with poetry, if you understand it directly, it may appear nothing else but a cluster of random meaningless or even contradictory words, but try to visualise what those words symbolise and the whole picture will become clear. Isn’t it intriguing what one of the Chinese famous painters said: “he who seeks a reflection of reality in a painting, has an insight of a child”. It brilliantly defines what ink painting and calligraphy is, and how it is interpreted in the Far Eastern cultures. Having the above in mind, the next time you will encounter a Chinese or Japanese calligraphy or ink painting, instead of trying to see ruffled waves in the calligraphy of the character “sea”, feel the unstoppable and intimidating power of water, its fluent nature, suppleness and amazing adaptability, patience and perseverance though time, or simply, its life giving power. Look for the energy hidden within the black ink strokes, and not the real-life material objects that they may resemble.